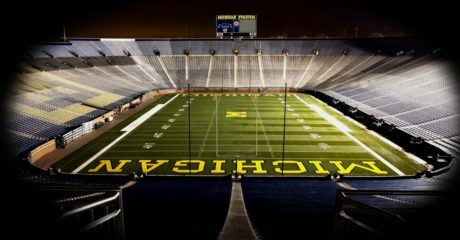 Spencer Brown – OT – Walled Lake (MI) Western: Brown is a 6’6″, 295-pounder who has been committed to Michigan State since July of 2017; he also has offers from Iowa, Miami, Michigan, and Pitt, among others. He’s a 3-star, the #42 offensive tackle, and #401 overall. 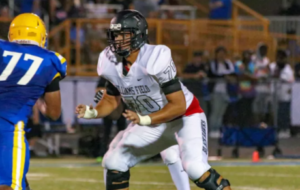 Steele Chambers – LB – Roswell (GA) Blessed Trinity: Chambers is a 6’2″, 215 lb. 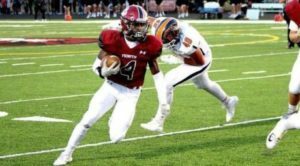 prospect with offers from Alabama, Auburn, Clemson, Georgia, Michigan, Notre Dame, and Ohio State, among others. He’s a 4-star, the #30 athlete, and #340 overall. 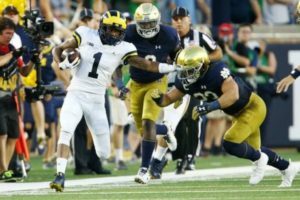 As a junior in 2017, he had 198 carries for 1,301 yards and 23 touchdowns; he also made 70 tackles, 6 tackles for loss, 2.5 sacks, and 1 interception. 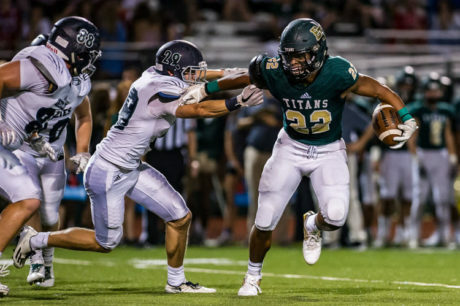 Lance Dixon – LB – West Bloomfield (MI) West Bloomfield: Dixon is a 6’3″, 195-pounder with offers from Michigan, Michigan State, Notre Dame, Ohio State, and Penn State, among others. He’s a 4-star, the #18 outside linebacker, and #286 overall. Right now 83% of the Crystal Ball picks are for MSU. Dontay Hunter – DE – Westerville (OH) Central: Hunter is a 6’4″, 228 lb. 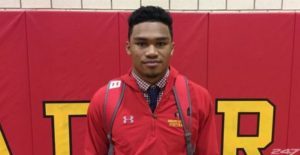 prospect with offers from Indiana, Kentucky, Maryland, and Pitt, among others. He’s a 3-star, the #36 strongside end, and #509 overall. He claims a 4.72 forty. There are 9 predictions for Kentucky, which are the only Crystal Ball picks so far. 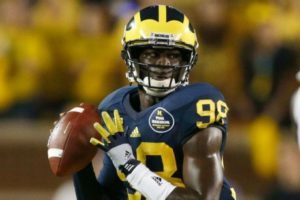 Adisa Isaac – DE – Brooklyn (NY) Canarsie: Isaac is a 6’5″, 210 lb. prospect with offers from Alabama, Florida, LSU, Michigan, and Penn State, among others. He’s a 4-star, the #26 strongside end, and #304 overall. 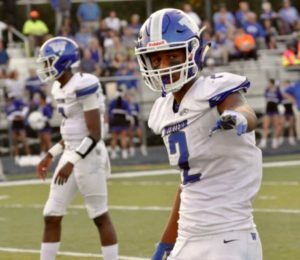 Sam Johnson III – QB – Walled Lake (MI) Western: Johnson is a 6’3″, 195-pounder with offers from Boston College, Indiana, and Michigan, among others. He’s a 3-star, the #20 pro-style quarterback, and #670 overall. He’s a teammate of Spencer Brown (see above). 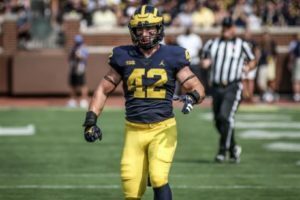 Many thought he would commit to Michigan after the offer, but Cade McNamara may have beaten him to the punch and stolen his spot. Regardless, 61% of the Crystal Ball picks are in favor of Michigan at this point. George Karlaftis – DE – West Lafayette (IN) West Lafayette: Karlaftis is a 6’5″, 260 lb. 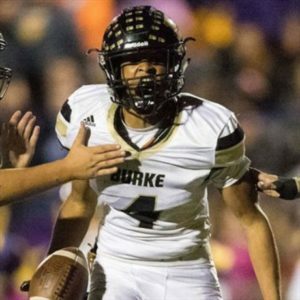 Purdue legacy who committed to the Boilermakers in October of 2017; he also has offers from Alabama, Clemson, Florida, Miami, Michigan, Notre Dame, Ohio State, and Penn State, among others. He’s a 4-star, the #13 strongside end, and #171 overall. Tre Mosley – WR – West Bloomfield (MI) West Bloomfield: Mosley is a 6’2″, 175 lb. prospect with offers from Boston College, Indiana, Michigan, and Michigan State, among others. He’s a 3-star, the #91 wide receiver, and #679 overall. He’s a teammate of Dixon (see above), Paige, and Wheeler (see below). Gabe Newburg – DE – Clayton (OH) Northmont: Newburg is a 6’5″, 230 lb. prospect with offers from Cincinnati, Michigan, Michigan State, Rutgers, and some MAC programs. He’s a 3-star, the #53 weakside end, and #799 overall. In the wake of his visit – which resulted in an offer – he is now favored to go to Michigan with 100% of the 247 Sports Crystal Ball picks. Brandon Smith – LB – Mineral (VA) Louisa: Smith is a 6’5″, 215 lb. prospect with offers from Alabama, Michigan, Notre Dame, Ohio State, Penn State, and Virginia Tech, among others. He’s a 5-star, the #1 inside linebacker, and #19 overall. 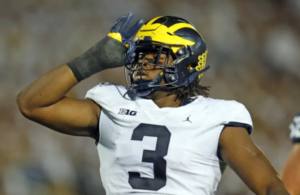 Some people have pegged him for defensive end, but he says he wants to play a linebacker, and Michigan is recruiting him as a linebacker. He’ll be visiting on April 3. 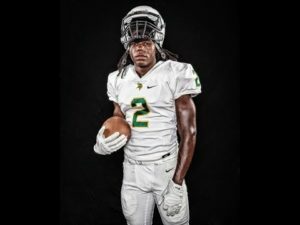 Dylan Wright – WR – Mesquite (TX) West: Wright is a 6’3″, 192-pounder with offers from Alabama, Auburn, Florida State, Georgia, LSU, Michigan, Notre Dame, Ohio State, and Oklahoma, among others. He’s a 4-star, the #31 wide receiver, and #185 overall. Hit the jump for several 2020 visitors. Jacolbe Cowan – DE – Charlotte (NC) Providence Day School: Cowan is a 6’5″, 250 lb. prospect with offers from Alabama, Clemson, Florida State, Georgia, LSU, Michigan, Notre Dame, and Ohio State, among others. He’s a 247 Sports 4-star, the #3 strongside end, and #37 overall. 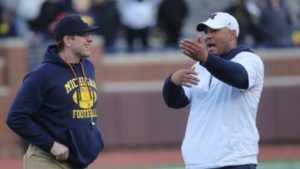 He visited Michigan on Monday, March 26. Christian Fitzpatrick – WR – West Bloomfield (MI) West Bloomfield: Fitzpatrick is a 6’3″, 195 lb. prospect with offers from Boston College, Illinois, Indiana, and Louisville, among others. 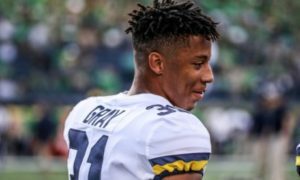 He’s the younger brother of Dez Fitzpatrick. Sterling Miles – DE – West Bloomfield (MI) West Bloomfield: Miles is a 6’5″, 210 lb. prospect with no offers at this time. Makari Paige – S – West Bloomfield (MI) West Bloomfield: Paige is a 6’3″, 182 lb. prospect with offers from Boston College, Indiana, Kentucky, Michigan, and Minnesota. He’s a 247 Sports 4-star, the #8 safety, and #189 overall. 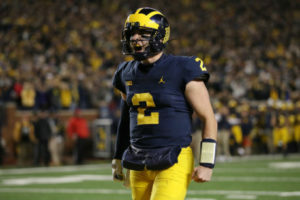 Right now 100% of the Crystal Ball picks are for Michigan. 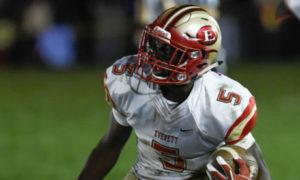 Kevin Swint – LB – Carrollton (GA) Carrollton: Swint is a 6’3″, 220-pounder with offers from Alabama, Georgia, LSU, Michigan, and Ohio State, among others. He’s a 247 Sports 4-star, the #11 outside linebacker, and #187 overall. 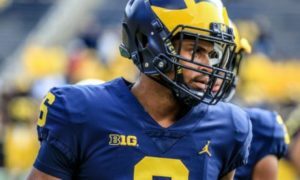 He’s a teammate of 2019 offensive guard Ty Murray, who visited Michigan last week and named the Wolverines his #1 school. Cornell Wheeler – LB – West Bloomfield (MI) West Bloomfield: Wheeler is a 6’1″, 220 lb. prospect with offers from Michigan, Syracuse, and Toledo. He’s a 247 Sports 3-star, the #10 inside linebacker, and #316 overall. Chaz Chambliss – LB – Carrollton (GA) Carrollton: Chambliss is a 6’3″, 220 lb. 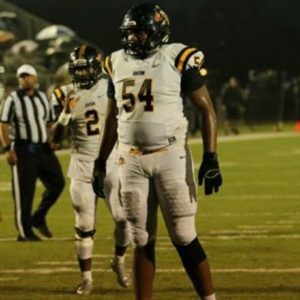 prospect with offers from Georgia, Georgia Tech, Michigan, and Ohio State, among others. He’s a teammate of Swint (see above). Donovan Edwards – RB – West Bloomfield (MI) West Bloomfield: Edwards is 5’11”, 175-pounder with no offers right now. Jack Sawyer – DE – Pickerington (OH) North: Sawyer is a 6’5″, 200-pounder with offers from Cincinnati, Kentucky, Michigan, and Penn State, among others. i want Steele Chambers. I’m not even gonna bother with the film … this time. He has some nice open field tackles. For some reason, he ball carrying isn’t catching my eye. Not that he can’t carry the ball. 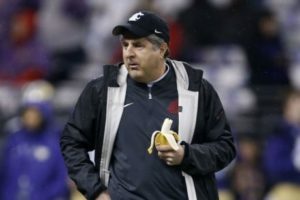 I’d take George Karlaftis in a heartbeat, but can you imagine the pressure a West Lafayette kid, first Purdue commit, and class leader would be under if he flipped?